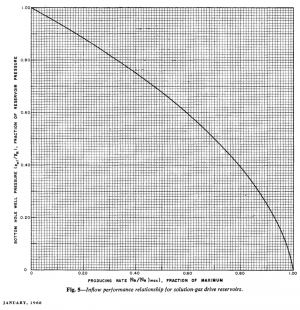 Vogel's IPR is an empirical two-phase (oil + gas) inflow performance relationship correlation published in 1968 . Vogel's IPR is based on computer simulations to several solution gas drive reservoirs for different fluid and reservoir relative permeability properties. Vogel's IPR is the default IPR correlation to calculate oil wells performance in the PQplot nodal analysis software which is available online at petroleum engineering site www.pengtools.com. , oil flow rate at the bubble point. , maximum oil rate or absolute open flow (AOF). , oil rate at given flowing bottomhole pressure. , productivity index for test below the bubble point pressure. 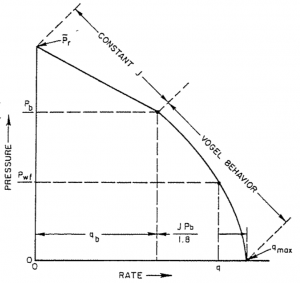 Vogel's IPR solution has been found to be very good and is widely used in prediction of IPR curves. With the help of the PQplot software, other values of flowing pressure has been assumed, and the corresponding values of flow rate were determined. From these, the IPR cure was plotted (Fig.1). ↑ 1.0 1.1 1.2 Vogel, J. V. (1968). 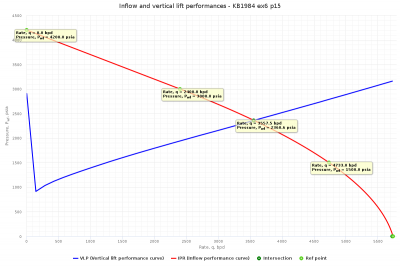 "Inflow Performance Relationships for Solution-Gas Drive Wells". Journal of Petroleum Technology. 20 (SPE-1476-PA). ↑ 2.0 2.1 2.2 2.3 2.4 2.5 Brown, Kermit (1984). The Technology of Artificial Lift Methods. Volume 4. Production Optimization of Oil and Gas Wells by Nodal System Analysis. Tulsa, Oklahoma: PennWellBookss. ↑ Neely, A.B. (1976). Use of IPR Curves. Houston, Texas: Shell Oil Co.